MULLAITIVU: An air strip located 5km westwards of Mullaittivu lagoon belonging to the LTTE has been located by the troops of the 59 Division today (Jan 10). The airstrip is 2.5km long and 100m wide. Two hangers where aircrafts are grounded have been discovered on the airstrip. This is the 4th LTTE airstrip secured by the troops. The Maharagama Police have arrested a UNP Member of the Kotte Municipal Council, with regard to the attack on Sirasa. Minister Mahindanana Aluthgamage told reporters that the Police examined the residence of this Municipal Councilor, based on a call received by the emergency division, and arrested him with a vehicle without a number plate. Information is revealed that the suspect had exchanged weapons opposite a private bank in Rajagiriya in the wee hours on the 6th of this month, using this vehicle. In addition, the Police had received a complaint on a threat to the Nayaka thera, by a certain group which had arrived in a Pajero to the Devram Vihare on the previous night. The Police said another UNP politician is also said to be involved in this incident. Informed sources said the Kotte UNP Municipal Councilor had threatened the Police to release the related politician who has been taken into custody. The Maharagama Police are conducting inquiries into the arrested Municipal Member and the vehicle without a number plate. Hambantota Port near the main shipping route across the Indian Ocean is part of a Chinese effort to enhance trade activities, news reports say. It is being built mainly with a Chinese loan and by two Chinese construction firms. It is envisaged first as a bunkering facility and later a port for general cargo vessels and eventually to tranship containers. 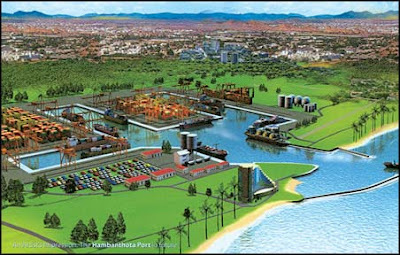 Hambantota was chosen as the site for the new port because of its proximity to the main shipping lane across the Indian Ocean. The report, "Joint Operating Environment 2008," was produced by the Norfolk-based U.S. Joint Forces Command, The Washington Times said. The Washington Times quated a US Chinese Embassy spokesman Wang Baodong said: "It's true that China is conducting cooperation with some Asian countries in various fields including ports developing, but it is justifiable business for China and the joint ventures are for commercial purposes only," Wang was quoted as saying. "People should see China's activities with a sensible and more balanced approach. As facts have proven, China's activities are for mutual benefit and peaceful purposes, constituting no threat to anyone else." Construction work is ahead of schedule, Sri Lanka Ports Authority officials said. According to some other sources, NO surrender has taken place or it is NOT confirmed yet. Apologies for misinformation. 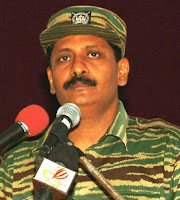 According to unconfirmed sources, Pottu Amman, LTTE intelligence wing leader and second in LTTE military wing after leader Velupillai Prabhakaran, has surrendered to the Government of Sri Lanka on Friday (Jan 09). The surrender has taken place in an undisclosed location when the LTTE veteran handed himself over to a Sri Lanka Army (SLA) Special Forces unit. Pottu Amman has been taken into Special Forces custody and is held in an undisclosed location, where he is being interrogated by SLA. Pottu Amman joined the LTTE in 1981 and was in charge of planning and the brain behind the most of LTTE's covert and terrorist activities. “Elephant Pass" is the last LTTE bastion in Jaffna Peninsula to fall. 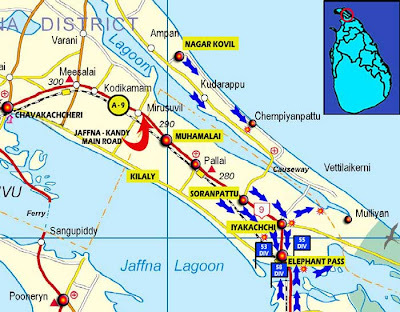 A-9 highway, the main supply route to Jaffna from the mainland, has been fully restored. Today (Jan 09) 53 Division commanded by Brigadier Kamal Gunaratne and 55 Division commanded by Brigadier Prasanna Silva based in the Muhamalai area have advanced nearly 22km South and captured the last LTTE bastion and hoist the National Flag once again in the strategically important Elephant Pass (EPS), which had been held by the LTTE for over eight years. In 1990, EPS was developed into a major military base complex by Sri Lanka Army (SLA). On 22nd April 2000, LTTE overran the EPS base complex after a tactical withdrawal by SLA. 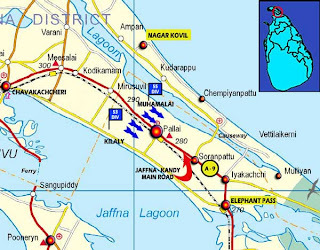 The importance of the re-capture of Elephant Pass is that the A-9 highway, the main supply route to Jaffna from the mainland, has been restored. Now the entire A-9 highway is under Sri Lanka Government control. The public will have easy access without the need for the people of all communities to pay taxes/duties on their goods as was the case during the period after the Ceasefire Agreement (CFA) signed by then Prime Minister Ranil Wickramasinghe on 22nd February 2002 until the beginning of 2006. Sri Lankan troops are fighting inside Elephant Pass, the strategic gateway to the Jaffna Peninsula held by the separatist Tamil Tiger rebels, the government said Friday (Jan 09). "We haven't captured it. We are moving in and fighting is going on," defence spokesman Keheliya Rambukwella, who is also a minister, told Reuters. Some media reports said it had been captured, but Rambukwella said that was premature. The Liberation Tigers of Tamil Eelam (LTTE) could not be reached for comment, but have repeatedly vowed to reverse a string of defeats that have prompted many to ask if a ground war that started in 1983 is finally nearing its end. The former army base is as strategic as it is symbolic for the military. Its capture will put all of Jaffna in government hands for the first time since 2000, when the army lost Elephant Pass in one of its worst defeats in the 25-year war. 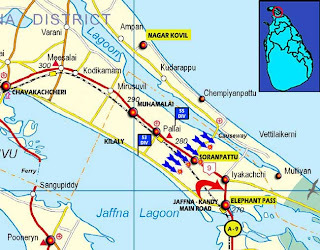 It will also open up the main north-south A-9 road linking Jaffna to the mainland, freeing up a mechanised division to join the battle now moving east towards the LTTE's last stronghold in the eastern port of Mullaittivu and its environs. Soldiers of Sri Lanka Army 55 Division have liberated Soranpattu village yesterday evening (Jan 8), said the defence sources in the Jaffna peninsula. Soranpattu is situated 9 Km from Elephant Pass and 5.2 Km from Pallai town down the A-9 road (Jaffna- Kandy). Earlier in the day, troops of Army 53 Division marching along the South of A-9 axis liberated the Pallai Township. “This heinous crime points to the grave dangers faced by the democratic social order of our country, and the existence of forces that will go to the furthest extremes in using terror and criminality to damage our social fabric and bring disrepute to the country,’ states President Mahinda Rajapaksa on the murder of Mr. Lasantha Wickramatunga, Editor of The Sunday Leader. “It is significant that such an attack was carried out at a time when the country is gaining repeated victories over the forces of terrorism, in our efforts to establish freedom and democracy throughout the country”, the President adds. My government and I most vehemently and unequivocally condemn the murder of Mr. Lasantha Wickramatunga, Editor of The Sunday Leader, which took place today. I am both grieved and shocked by his tragic death as Mr. Wickramatunga was a close friend of mine who I have known for many years as a courageous journalist. This heinous crime points to the grave dangers faced by the democratic social order of our country, and the existence of forces that will go to the furthest extremes in using terror and criminality to damage our social fabric and bring disrepute to the country. It is significant that such an attack was carried out at a time when the country is gaining repeated victories over the forces of terrorism, in our efforts to establish freedom and democracy throughout the country. I have directed the Police to conduct the most thorough investigation to bring to book any and all persons responsible for this act of brutality, with maximum speed. On this sad occasion I extend my deepest sympathies to the members of the family of the late Mr. Wickramatunga, to all his colleagues in The Sunday Leader and associated newspapers, and in the profession of journalism. Despite grave threats of this nature, my government reiterates its commitment to upholding the principles of Media Freedom and Freedom of Expression, even under the most trying circumstances, as we have witnessed today. The World Alliance for Peace in Sri Lanka (WAPS) is a collective of independent expatriate organizations spread across the globe, not aligned to any political party, who have been fighting to counter false LTTE propaganda and safeguard the national interests of Sri Lanka. Some of our constituent organisations and individual members have done so for nearly 25 years. WAPS came into being on the heels of the World Federation of Overseas Sri Lankans, as a global collective of organisations at the time of the questionable leadership of Chandrika Kumaratunga and the weak-minded government of Ranil Wickremasinghe. In those dark days even with the government itself carrying LTTE propaganda we attempted to tell the truth. Our activities across the globe including in Norway as well as events we organised in Sri Lanka helped expose LTTE perfidy as well as those of our then ruling cliques. Those who attended our events were later to help form some of the present government’s successful ideological and military campaign against the LTTE. constituents of the present government as well as by patriotic political elements that are now in the opposition. In the darkest hour of Chandrika Kumaratunga and Ranil Wickremesinghe all these forces stood by this country. We salute them. As our Armed Forces regain vast tracts of usurped territory, and free the entrapped civilians under the jackboot of a modern Hitler we wish them safety in this final push. But we must ensure that what the country has won in war will not be lost in peace. Forces, both internal and external, that in many ways tried to prevent the military victory are now waiting to change the victory to a camouflaged defeat. We should remind ourselves that this time it is not like the 1980s where India having trained and armed all the separatist forces imposed the 13th Amendment against all international norms. WAPS considers the 13th Amendment as a travesty imposed on a small nation by a regional bully as part of her external policy. Where the 13th Amendment has been applied today it has become a white elephant increasing the cadres of corrupt politicians at the provincial level and as studies show, a major drain on the economy. We urge the present leaders of the All Party Representatives Conference to revisit the reasons for the unitary constitution which their betters then formulated. But good governance demands participation at the very grass-roots not just to carry out diktats of corrupt political bosses. We urge that suitable grass root models be explored including India’s Panchayat system. Devolution to party bosses should not extend beyond the district. In addition, we would recommend a more equitable power sharing arrangement at the Centre where the minorities would be drawn into the decision making process from the policy making stage to the implementation stage through fair representation in special Parliamentary Sub-Committees and Experts Committees, where they would participate in the day to day governance of the nation. We call on the government to speedily develop the north and east so that the development that the LTTE denied them could be quickly made up. If found necessary, we request transfer of development funds from other parts of the country to these regions. The model should be the multi-ethnic Western province where all ethnic and religious groups live side by side. The victory that we have won has been against a host of local and international forces. We urge the government to stand firm and resist external powers who want to dictate to us how we should govern our country. We have been at the receiving end of such unsolicited advice for 500 years. A major tool of foreign interference has been foreign funded NGOs, literally a few individuals fattened by foreign money masquerading as civil society. It is their lies that we at WAPS had often to counteract. We urge the government to deny foreign funds to any organization that has questioned our sovereignty. Only allow foreign funds to real civil society in the form of professional organizations, trade unions and similar elected organisations rooted in this country. With this second coming of independence through our Armed Forces we can rebuild this country so that all its citizens can share in its fuller development. WAPS believes that the day is not far off for this. 4. Western Australia Society for Peace, Unity and Human Rights, Western Australia, Australia. 6. Sri Lankans Against Terrorism (SLAT), North South Wales(National Office), Australia. 7. Sri Lanka Society of South Australia. 8. Pacific Alliance for Peace in Sri Lanka (PAPS), Victoria (National Office), Australia. 9. Canadian Association for United Sri Lanka (CAUS), Canada. 10. Sri Lanka United National Association (SLUNA), Canada. 11. United Sinhalese Association in Italy, Rome, Italy. 12. Ape Shakthi Sanvidanaya, Auckland, New Zealand. 13. The International Campaign for the Liberation of the Sinhala Nation, United Kingdom. 14. Sinhala Association of Sri Lankans, United Kingdom. 15. Sinhala Centre, United Kingdom. 16. Now York Society of United Sri Lankans, United State of America. The valiant troops of the 53 and 55 Divisions liberated the strategically important LTTE PALLAI Stronghold this morning (Jan 8), as a result of the bitter clashes which continued since yesterday. 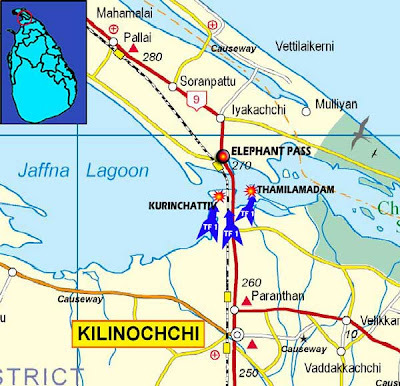 The troops who captured the PALLAI town have consolidated their positions in the newly captured town area and have now entered the KILINOCHCHI district and accelerating their operations towards Elephant Pass. The troops are advancing under the leadership of Brigadier Kamal Gunrathne of the 53 Division and Brigadier Prasanna Silva of the 55 Division. Meanwhile the ground troops state that the remaining distance to reach the Elephant Pass area is only 14km. Lasantha Wickramatunga, editor of the Sunday Leader newspaper, was shot on Thursday while he was driving his vehicle at around 10.30 a.m at the Bakery Junction in Attidiya, a suburb of Sri Lankan capital Colombo. Ranjith Gunasekara, a police spokesman, said Wickramatunga was targeted by two armed men on a motorcycle. He added that Wickramatunga was in a critical condition and that officers were investigating the attack. "He was on his way to work when he was shot... we heard that he had been shot in the chest, head and the abdomen," a colleague of Wickramatunga told the AFP news agency. The Government has decided to open the Rupee denominated Treasury bill and Treasury bond market for the Sri Lankan Diaspora and Migrant Workforce with effect from January 6. This new initiative was announced in the Central Bank ‘Road Map: Monetary and Financial Sector Policies for 2009 and beyond’. Through this scheme, it is expected to widen the investor base, diversify the Government Securities market, make it more convenient for Sri Lankans living abroad to access Government Securities, and to create a more stable Government securities market. This scheme will also provide a safe and highly liquid investment opportunity for Sri Lankans living abroad, while providing them with an attractive return on their investments. To facilitate this endeavour which is expected to cover almost the entire globe, six Joint Lead Managers, namely, Bank of Ceylon, Commercial Bank of Ceylon PLC, National Savings Bank, NatWealth Securities Ltd., People’s Bank and Sampath Bank have been appointed. This programme initially will be launched in selected regions from January, 2009 onwards. The regions will include the Middle East (Dubai, Abu Dhabi, Kuwait, Jordan, Lebanon, Qatar, Bahrain, Saudi Arabia and Oman), Europe (Italy, France, Switzerland, Germany, The Netherlands and UK), North America (USA and Canada), Asia (South Korea, Malaysia, Singapore, Japan, India and Bangladesh). In addition, the programme will cover Australia and New Zealand. Investments in Treasury bills or Treasury bonds could be channelled through any one of the Joint Lead Managers, using the Treasury bill/bond Investment External Rupee Account-D (TIERA-D) to be opened by the investor for that purpose. Remittances into and out of TIERA-D accounts would be free from exchange controls. This scheme will benefit, Sri Lankans living abroad, including Sri Lankans who have made their permanent residence overseas (Non-residents), citizens of Sri Lanka who have taken up overseas employment or set up business abroad, citizens of Sri Lanka with dual citizenship living in Sri Lanka or abroad, and Sri Lankan professionals living in Sri Lanka or abroad who earn income in foreign currency. Following the day-long fighting, troops of 58 Division (earlier Task Force 1) have entered into the Murasumoddai town perimeter by this afternoon (Jan 7), reports from the battlefront said. Battle formations of 58 Division who have continued their offensive march further eastwards after capturing Paranthan, entered Murasumoddai town despite stiff resistance from the LTTE. Gaining control over the Murasumoddai junction, located along the Paranthan-Mullattivu A-35 road 5 km east of Paranthan, is strategically vital for the troops as it creates new escape routes for the civilians being forcibly detained by the LTTE. 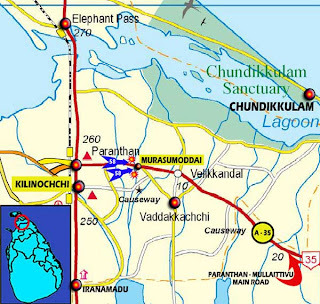 The Murasumoddai junction has direct access routes to Kilinochchi, Vaddakachchi and Uriyan areas. Sri Lanka's cabinet reinstituted on Wednesday a ban on the Tamil Tiger rebels which designates them as a terrorist group, Sri Lanka's defence spokesman said. "The cabinet has decided to ban the LTTE as they are not allowing civilians to leave the war zone," defence spokesman Keheliya Rambukwella, also a minister, told a press conference. The ban against the Liberation Tigers of Tamil Eelam (LTTE) was lifted in 2002 at the start of an ill-fated six-year truce. AND WHEREAS, the territorial integrity and sovereignty of the Democratic Socialistic Republic of Sri Lanka has been threatened by these continuous acts of terrorism and other acts of violence perpetrated by the said organization known as the Liberation Tigers of Tamil Eelam, and such as acts have endangered the interests of public security, the preservation of public order, and the maintenance of supplies and services essential to the life of the community. Now THEREFORE it has become necessary to proscribe the said organization known as the Liberation Tigers of Tamil Eelam and to provide for the proscribing of other organizations that are connected with or which are representing or acting on behalf of the organization known as the Liberation Tigers of Tamil Eelam and which have therefore become prejudicial to the interests of public security , the preservation of public order and the maintenance of supplies and services essential to the life of the community, His Excellency the President intends promulgating regulations in terms of the Public Security Ordinance(Chapter 40). Given at Colombo, on this 7th day of January Two Thousand Nine. By His Excellency's Command, signed by Secretary to the President, Lalith Weeratunga. The fall of Kilinochchi represents an important point in the 25-year war that has divided Sri Lanka. We hope that this event will help hasten an end to the conflict. The U.S. believes that a lasting, sustainable peace can best be achieved if the Sri Lankan Government works now to reach a political solution that addresses the aspirations of all Sri Lankans, including Tamils, Muslims, and Sinhalese. The United States does not advocate that the Government of Sri Lanka negotiate with the LTTE, a group designated by the United States since 1997 as a Foreign Terrorist Organization. However, we do believe that a broad range of other Tamil voices and opinions must be brought into a political process to reach a political solution that Tamils inside and outside of Sri Lanka see as legitimate. This will help assure Tamils that their rights are protected, that they have a say over important areas of their lives in geographical areas in which they predominate, and that they are an integral and respected part of an undivided Sri Lanka. At the same time, such as process would further delegitimize and erode the support of the LTTE in Sri Lanka and abroad. A UNP-led protest rally called ‘Enough is Enough’ will be held at the Hyde Park this afternoon to pressure the government to bring down cost of living. A spokesman for the UNP told The Island that a number of Opposition parties including the SLMC, WPF, the SLFP(M) and civil society organisations would take part in the demonstration. "We will also agitate for the government to comply with the Supreme Court directive to reduce the price of petrol from Rs. 122 to Rs. 100. Leader of the UNP Ranil Wickremesinghe said that the government had asked the people to tighten their belts due to the war. "It is time that they eased the burden of the masses by bringing down the cost of living." A government, which says that the LTTE has been defeated, continues to use the war to cover up its incompetence and inability to provide the people with goods and services at reasonable prices," he said. Security forces and police personnel who died in action and their families should be paid adequate compensation, Wickremesinghe said. "We urge that a minimum of Rs. 5 million be paid to the family of each dead soldier and Rs. 2. 5 million to each of the injured," he said. Sri Lankans in Calgary met at the Ehipassiko Buddhist centre on Sunday, December 28, 2008, to provide support to the security forces in Sri Lanka, who are engaged in a bitter battle with the Liberation Tigers of Tamil Eelam (L.T.T.E). The meeting was presided by the acting chief incumbent as the Buddhist Centre, Ven. Werapitiya Somananda. The ceremony began by offering flowers, incense, etc. to Lord Buddha. It was followed by chanting pirith. In addressing the audience, Ven. Somananda delineated the dangerous and risky circumstances under which security forces are operating and their sacrifice, and dedication to liberate our homeland. He stipulated the consequences of the operation which has resulted in attempting to achieve their objectives. Ven. Somananda transferred the merits acquired to the families whose loved ones sacrificed their lives during combat or to the innocent victims of the confrontation. He also invoked blessing to those who received temporary injury or permanent injury and wished all those affected a speedy recovery. Apart from the civil war, Ven. Somananda briefly reminded the audience the large number of lives lost and thousands that were left homeless when the tsunami devastated the coastal regions of Sri Lanka a few years ago. He transferred the merits acquired by the audience to those who passed away and to those who were affected by the tsunami. He expressed his deepest sympathy to those who experienced the tsunami and to the families who lost their loved ones, finally in concluding the brief message of condolences to the security forces and the people of Sri Lanka, Ven. Somananda blessed for peace in Sri Lanka in the near future. The Society for Peace Unity and Human Rights for Sri Lanka (SPUR) humbly salutes the decisive political and military leadership of Sri Lanka, the bravery, commitment and sacrifices of its Defence Forces, and the determination of its people for collectively defending the identity, territorial integrity and the Unitary status of the country. The heroic battles to liberate major sections of sovereign Sri Lankan territory which had been illegally occupied by the Liberation Tigers of Tamil Eelam (LTTE) and the fall of Kilinochchi, the de-facto capital of the terrorist leader Prabhakaran, will forever be etched in gold in the annals of Sri Lankan history. President Mahinda Rajapakse and his team deserve a big bouquet of thanks from all patriotic Sri Lankans for saving the country by standing up to the LTTE and its allies. Prior to his election, the LTTE was not only bragging about a de facto Tamil Eelam but strutting around the Western Capitals as fully fledged ‘national’ leaders. The previous Sri Lankan political leadership and the Colombo’s jet-set along with some business leaders were ever willing to provide the LTTE with character certificates for their own political and economic survival at the expense of the Nation. President Rajapakse, a democratic Parliamentarian for over four decades, led the country with unwavering resolve in the face of Tamil Tiger terrorism and the unprincipled guerrilla style tactics of some of his political opponents and racist Tamil and Muslim politicians who were supported by sections of the international community and Non Governmental Organisations who had designs on sharing the ‘spoils’ of Tiger Eelam. Under the President’s astute and decisive leadership, the Defence Secretary Lt Col (rtd) Gotabhaya Rajapakse ably supported by Service Commanders Lt Gen Sarath Fonseka, Vice Admiral Wasantha Karannagoda and Air Marshall Roshan Goonetileke have meticulously planned a comprehensive strategy to defeat the LTTE. They remind the nation of the valour and intelligence of our warrior Kings and great Military Commanders of the past. Our capable defence force leaders with the untiring commitment of the rank and file of the Army, Navy, Air Force and Police have methodically cornered the Tiger terrorists whose image was artificially blown up by anti-national propagandists. Like all Sri Lankans, SPUR salutes the heroic achievements of the defence forces and forever acknowledges the tremendous sacrifices made by them in terms of life and limb. The great deeds of our fallen military leaders such as Lt Gen Denzil Kobbekaduwa, Gen Vijaya Wimalaratne, Vice Admiral Clancy Fernando, Maj Gen Janaka Perera, Gen Parami Kulatunga, and the exceptional bravery of servicemen like Capt Saliya Aladeniya, Cpl (Hasalaka) Gamini Kularatne, Col Fazly Lafir, Lt Cdr Jude Lakmal Wijethunge, Lt Col Lalith Jayasinghe and Sgt. Namal Udawatte are already known to the Nation. The commitment and sacrifices of thousands of war heroes, in particular those who have given their lives defending the territorial integrity the country in the battlefields, high seas and the skies of Sri Lanka, will never be forgotten. We also pay a special tribute to the parents and family members of defence personnel, many from the rural areas of Sri Lanka, who have borne a disproportionate share of the human cost of the conflict. Last but not least, the great achievement in the battlefield would not have been possible without the unwavering support of the Sri Lankan people who have endured three decades of LTTE terror without compromising on their commitment to an undivided Sri Lanka where all its citizens can live in peace and harmony. We thank those patriotic Sri Lankan political parties, their leaders and members for strengthening the political base of President Rajapakse by correctly identifying the Nation’s priorities without concentrating on lesser issues that would have weakened the thrust of the Defence Forces battle with the ‘world’s most brutal terrorist group’. It is necessary to also acknowledge the support received from a number of democratic Tamil Leaders and former Tamil separatist who have now joined the democratic mainstream, proving that the LTTE is not a credible representative of the Sri Lankan Tamil people. We remember with gratitude the thinkers, writers, reporters, media editors, webmasters, artists and the expatriate organisations who lent their support to counter the vicious anti Sri Lankan propaganda campaign of the LTTE, their fronts, their hirelings in the NGO/INGO circuits, pro LTTE members of the international community, some religious groups and the anti-national media. The national fight against LTTE was buttressed by the Sri Lankan patriotic groups who not only galvanised the Sri Lankan people by highlighting that the survival of the Nation is a priority, but, also engaged in programs to boost the morale of the defence forces and the public affected by LTTE threats. It with utmost humility that we at SPUR, along with sister organisations in Sri Lanka, Canada, USA, UK, Germany, Italy, France, Switzerland, Norway, Sweden, UAE, New Zealand, Japan and Australia, supported Mother Lanka by presenting a realistic view of the Nation as opposed to the separatist and terrorist agenda championed by the LTTE fronts and the unsuspecting groups in the foreign countries who were misled. Our organisations were able to raise the public awareness within expatriate Sri Lankan communities and also contribute towards the welfare of defence staff and their families as well as those in threatened villages. It is not out of place to refer to the unfortunate but scurrilous attacks carried out by some politically bankrupt members of the opposition and anti-national local media who sometimes even ridicule the leadership of the Defence establishment in an attempt to resurrect the LTTE and achieve narrow political objectives. Others in this category include pseudo religious groups, assorted ‘Peace’ and ‘Human Rights’ NGO’s, foreign funded ‘Policy Centres’ and ‘Foundations’ who overtly and covertly promoted a separatist agenda and encouraged international intervention in Sri Lanka. Tamil racist politicians of the TNA and some aligned to mainstream opposition parties openly championed ethnic separatism, flouted Sri Lankan laws and spared no efforts to mislead the overseas Tamils to raise funds for the LTTE’s war efforts. They also misrepresented the Sri Lankan situation to foreign politicians and sent wrong signals to India specially with the connivance of bankrupt politicians in South India. Some so-called Human Rights and Aid Organisations helped the LTTE in their propaganda war against Sri Lanka while others supplied heavy machinery to the LTTE who used these to built bunds and bunkers which caused great hardship and loss of life to the Sri Lankan armed forces. It is of utmost importance that patriotic Sri Lankans identify these forces which were active locally and internationally to destabilise the Nation. SPUR recognises that the cornered Tigers backed by its fanatical Diaspora supporters and assorted ant-Sri Lankan lobby groups, are still capable of the most violent acts of terror in a desperate grasp for its unattainable goal of an ethnically cleansed separate State of Tamil Eelam. However, like all Sri Lankans, we are confident that our heroic Defence Forces who are still engaged in intense combat under the most adverse weather conditions will finally eradicate the LTTE menace in the near future. SPUR also strongly supports the Sri Lankan Government’s call for the LTTE to release all Tamil civilians held captive as human shields and to lay down arms to avoid further destruction and loss of life. SPUR, as an organization that supports peace and human rights for all citizens within a Unitary Sri Lanka pledges its wholehearted support to the task of building a strong, peaceful and democratic Sri Lanka. Military Spokesman Brigadier Udaya Nanayakkara addressing the media on security information said the troops of the 53rd and 55th Brigades took control of the LTTE Forward Defence Line in Muhamalai. Thereafter the terrorists had to retreat to Palai. The Brigadier said during the swift incursion, the troops gained 500 to 600 meters ground territory this morning. Troops of the 58th Division yesterday succeeded in capturing Kadduwankaddu and Thamilamadam. The terrorists have also lost the main supply route South of Elephant Pass. Speaking further to the journalists the Military Spokesmen pointed out that operations are afoot to overrun Mulleyawelli. He said that troops of Task Force three and four are continuing their operations after consolidating their positions up to Oddusuddan. The Tamilnadu politicians who gave undercover support to LTTE to create a separate state (Eelam) in Sri Lanka for the so called "oppressed minority Tamils" are now trying to openly say that the world was seeing only the tip of the iceberg of 100 million Tamils working behind the scene: tamilnet article. For those who are not familiar with the issue in Sri Lanka, LTTE was fighting for a separate mono-ethnic Tamil state for the estimated 3 million Tamils in Sri Lanka (14% of the population). The proposed state occupies 2/3 of the coast of Sri Lanka and 1/3 of the land. However, 54% of the above 3 million Tamils are traditionally settled in the South among Sinhalese and other ethnic groups. Of course there were legitimate Tamil grievances in Sri Lanka that could be settled through a process of dialog, and obviously there were dark incidents where the Sinhalese over reacted in the post-colonial power struggle. However, for the World Tamil Movement who were eyeing at a Tamil state covering a part of Sri Lanka and India, the first strategic move was to claim a part of Sri Lanka saying the Tamil minority is oppressed, when the truth is 100 million Tamils were behind the frontline of 3 million Sri Lankan Tamils against 16 million Sinhalese with an annual financing of US$300 million for the LTTE (Jane's intelligence review). So far the world did not believe this. Now the king makers have begun to play in the open. Hope India will not succumb to these racist elements. Troops of the Task Force-1 have reached the southern outskirts of Elephant Pass (EPS), the South most LTTE stronghold in the Jaffna peninsula after series of heavy clashes with the terrorists. According to the battlefield reports, troops have gained total control over Kurinchattiv village located on the eastern bank of Jaffna lagoon and entered Thamilamadam area this afternoon (Jan 5). The fall of Kurinchattiv draws tactical advantage to the security forces, who are determined at flushing out the remaining LTTE fortifications in the Elephant Pass, Kilaly, Muhamalai and Nagarkovil areas, the sources said. Further troops moved more eastwards from A-9 road and entered a fishing village - Thamilamadam. Thamilamadam is located south of Jaffna lagoon which is a very low-lying area. Kurinchattiv with its unique high ground area, a vital topographical feature adds more advantage for the recent military manoeuvres of the SL Army where troops wi [Click to magnify/shrink] ll be able to concentrate heavy gun attacks at all directions, the sources further said. According to latest reports received from the battlefront, TF-1 troops are further pushing into the EPS while separate military fighting formations are marching eastwards at LTTE last bastion in Mullaittivu, security sources said. Work on 1900 of the 50,000 houses of Ranajaya Pura Ranaviru Village in the Ipalogama area for the war heroes has been completed. This was revealed by Defence Secretary Gothabaya Rajapakse addressing Air Force officers after inspecting several air bases. Mr. Rajapakse said it is the onus of the Service Chiefs and officers to look into the well being of those serving under them. Certain legal sangs had been eliminated. One related to housing and education. Some are not aware that his Ministry had several programmes for those who needed houses. Loans are available if anyone wanted to build a house on his land. Work on 1900 houses at Ipalogama in Anuradhapura is nearing completion. Those who wish to settle down in Anuradhapura can obtain these houses. It is planned to provide houses free of charge to those who are engaged in operations with dedication and to others at concessionary rates. He also revealed of plans to construct another housing scheme in Kurunegala. The Defence Secretary monitored the Ipalogama village while on his way to Katunayake from the air base at China Bay in Trincomalee. The Defence Secretary also had discussions with the Air Force Commander. According to the Ministry of Defence, troops of Task Force 4 who have continued their advances further northwards after capturing Nadunkeni have entered Oddusuddan township by this afternoon, 4 January. The strategically vital Oddusuddan junction located along the Mankulam - Mullaittivu (A34) main road had been used by the LTTE terrorists for their administrative and logistic purposes as it has direct route access towards Mullaittivu, Puthukkudiyiruppu, Mankulam and Nedunkeni. Air Force MI 24 fighter helicopters pounded on a gathering point of tiger terrorists located 6 km North – Eastwards to ODDUSUDDAN in MULLAITTIVU district today (04) around 6.30 a.m.
Another gathering point of tiger terrorists located 2 km Northwards of ELEPHANT PASS was pounded using MI 24 fighter helicopters in support of the soldiers of Task Force 01 today (04) around 1.20 p.m.
Again around 2.45 p.m. today yet another gathering point of terrorists located 4 km North Eastwards of KILINOCHCHI town was pounded using MI 24 fighter helicopters. This air strike was launched to support the ground forces of the Task Force 01. Air Force fighter jet planes launched air strikes on two gathering points of terrorists located at Elephant pass and PARANTHAN East today (04) around 5.00 p.m.. The air strikes assisted the soldiers of Task Force 01. 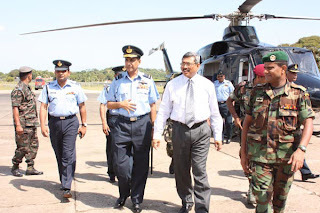 Secretary Defence Mr. Gotabaya Rajapaksa visited the Air Force bases at Hingurakgoda, Chainabay and Katunayaka yesterday, 3 January, in order to appreciate the outstanding service rendered by the SLAF towards the success of the Wanni liberation offensive in Kilinochchi and Mullaittivu fronts. Base Commander of Hingurakgoda Base, Wing Commander D.K Wanigasooriya, welcomed Secretary Defences when he arrived at Hingurakgoda Air Base during his visit. Addressing the officers and airmen of the MI-24 squadron, Secretary Defence praised their commitment by launching close air support missions to assist ground troops during the victorious Wanni liberation offensive. Later, he visited Chainabay Air Force base and Base Commander Group Captain Wijitha Gunarathna welcomed the Secretary Defence. After addressing the officers and airmen of the Chainabay base Defence Secretary flew to Katunayaka. Base Commander of Katunayaka Air Base, Air Commodore C.R Gurusinghe welcomed the Secretary Defence in his arrival to Katunayaka. Speaking to officers and airmen of No 12 (MI-27), No 10 (Kfir) and No5 (F-7) squadrons, Secretary Defence expressed his gratitude appreciated the service rendered by them for the success of Wanni battle. Defence Secretary was accompanied by Air Force Commander Air Marshal Roshan Gunathilaka and a few senior officials of the Air Force Headquarters. Air Force fighter jet planes pounded an LTTE sea tiger base in MULLAITTIVU area today (03) around 2.10 pm. Again MI 24 fighter helicopters launched an air strike on identified LTTE target 1.5 km East of PARANTHAN – MULLAITTIVU road today (03) around 1.20 pm. The LTTE FDL at MUHAMALAI South was pounded by the Air Force fighter jet planes today (03) around 5.45 pm. Pilots confirm the three air strikes were successful. Followed by the historic feat achieved by Army in capturing Kilinochchi, Commander of the Army Lieutenant General Sarath Fonseka accompanied by Wanni Security Forces Commander and a few senior officers of the Army Headquarters, flew to Vavuniya on Saturday (3) morning in a bid to take stocks of the ground situation in Wanni theater of war. 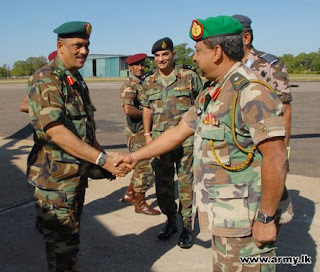 Divisional Commander, 57 Division Major General Jagath Dias received the Army Commander on his arrival at the airstrip. 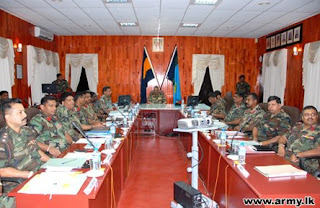 During the review meeting held at the Security Forces Headquarters Wanni (SFHQ-W) attended by Commanders of Divisions, Task Forces and Brigades, Wanni Commander appraised Lieutenant General Sarath Fonseka and other senior officers of the advances and gains the Army has so far achieved in Wanni humanitarian operations. At the end of the meeting Army Commander praised officers and other ranks of their commitment in achieving this great victory and gave necessary instructions to be adapted during future operations. Army Commander Sarath Fonseka and Air Force Commander Roshan Goonetilleke have totally rejected statements made by UNP leader Ranil Wickramasinghe that quick and complete attention had not been provided to soldiers who were injured in the warfront to save their lives. The Army Chief in a statement broadcast by the state owned ITN said, "The security forces have enough helicopters to transport injured soldiers immediately from the battlefield to necessary hospitals and after immediate treatment, if necessary there are enough transport planes to transfer them to Colombo for further specialized medical attention." In a sweeping statement he rejected the UNP leaders utterances as "untruth" and "distortions" meant to mislead. The Army Chief said, most of the soldiers hit in the battlefield are by heavy artillery and mortars possessed by the LTTE that were allowed to be smuggled into the country by politicians during the days of the Ceasefire Agreement and the very leaders who allowed those weapons into the country should be directly responsible for the injuries caused to the soldiers, in an obvious attack on Mr. Wickremesinghe. Many shiploads of weapons were allowed to be taken into the country during the time of Prime Minister Ranil Wickramasinghe while the country's Navy was asked to show a Nelsonian eye to the activities of the LTTE as a measure to save the Ceasefire Agreement, years ago. Opposition leader Ranil Wickremesinghe yesterday said that the government should immediately provide relief to the masses by reducing the price of fuel. He demanded that before the end of the month the price of a litre of petrol should be reduced to Rs 100, litre of diesel to Rs 50 and kerosene by another Rs 5. The government conveniently passed the burden on to the masses by using the war as an excuse and now it was boasting that the security forces had captured Kilinochchi, he said. Wickremesinghe said that five months ago when the price of a metric ton of milk powder was USD 4500, the price of a 400 gram milk powder packet had been increased to Rs 275. But the when the price of a ton of Milk Powder was reduced to USD 1000, government had been in a position to bring down the price of packet of milk powder to Rs 160 but it had refused to grant that benefit to the masses, he said.